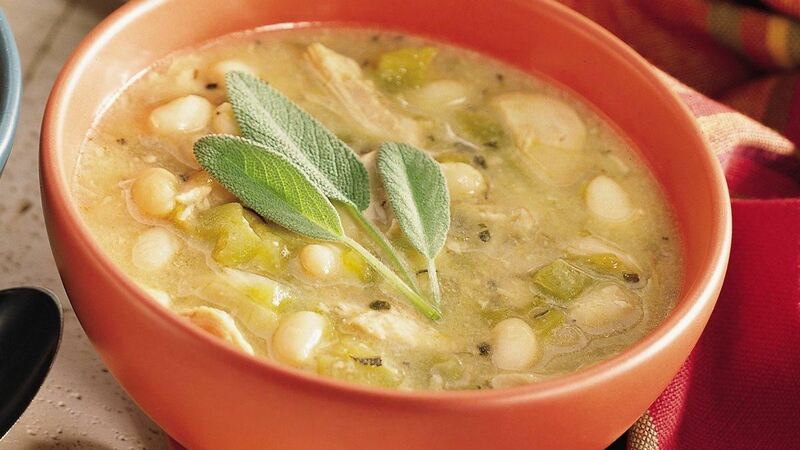 In 3 1/2 or 4-quart slow cooker, combine chicken, beans, onion, garlic, oregano, salt, soup and water; mix well. Cover; cook on low setting for 8 to 10 hours or until beans are tender and chicken is no longer pink. Just before serving, stir in cumin, hot pepper sauce and chiles. Serve with additional hot sauce if desired. Garnish with sage. Tip: This recipe was tested in slow cookers with heating elements in the side and bottom of the cooker, not in cookers that stand only on a heated base. For slow cookers with just a heated base, follow the manufacturer's directions for layering ingredients and choosing a temperature.